Tilted Horizons: Forcefield Back Protector Giveaway! Up for grabs is a Forcefield Pro L2 back protector, which has been winning all the comparison tests in the motorcycling press the last few years, particularly in Europe where they tend to be more safety conscious. Not only does this protector conform to CE Level 2 requirements, it conforms to the rider's back quickly and allows better air circulation than most other protectors. 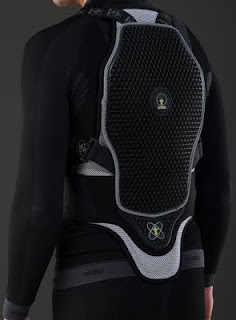 This protector straps to your body for closer fit and maximum protection; it does not install into a jacket sleeve. The Pro L2 was recently superseded by a Kevlar version and is being closed-out at $115; it was about $150 previously. This is a great chance for someone who has wanted to try a top-shelf back protector but hasn't been quite able to pull the trigger because of the cost. The winner will get to choose from either a Small or Medium (size charts here), both of which were worn by me once or twice for testing purposes, but if I didn't tell you that you'd never know them from brand new. For a chance to win this item and have it shipped to you (in Forcefield's original box) free anywhere in the USA, zap me an email (Doug at TiltedHorizons dot com) with the answer to this trivia question: In what year was the American Motorcyclist Association founded? (Hint: It was named the American Motorcycle Association when it was founded). The winner will be chosen in a random drawing among all correct entries received no later than midnight EST August 28, 2011. To double your chances, let me know that you visited five of the websites displayed at the top of this page. Viewing ten of the websites will triple your chances. (Any ad revenue generated by your clicks will be donated to the Ride for Kids program). Please do not attempt to enter the contest by posting the answer on a motorcycle forum from which this post is linked, or on my Facebook or Twitter. BTW, if you've entered prior contests, you're welcome to try again, even if you've won. Good luck! Update 9/8/2011: Maria from South Carolina won the drawing. She provided the correct answer of 1924. Enjoy the extra protection Maria, but please don't "audition" it!